These very popular picture frames feature a thin plastic edge and clear glass that pops out from the front of the frame for easy loading of photos. Very popular picture frame for 3.5x5 size photos features a thin plastic edge and clear glass which pops out the front for easy loading. Very popular picture frame for 4x4 size photos features a thin plastic edge and clear glass which pops out the front for easy loading. Very popular picture frame for 4x6 size photos features a thin plastic edge and clear glass which pops out the front for easy loading. Very popular picture frame for 5x7 size photos features a thin plastic edge and clear glass which pops out the front for easy loading. Very popular picture frame for 6x8 size photos features a thin plastic edge and clear glass which pops out the front for easy loading. Very popular picture frame for 8x10 size photos features a thin plastic edge and clear glass which pops out the front for easy loading. Very popular picture frame for 8x12 size photos features a thin plastic edge and clear glass which pops out the front for easy loading. Very popular picture frame for 8.5x11 size photos or documents features a thin plastic edge and clear glass which pops out the front for easy loading. Very popular picture frame for 9x12 size photos features a thin plastic edge and clear glass which pops out the front for easy loading. Very popular picture frame for 10x20 size photos features a thin plastic edge and clear glass which pops out the front for easy loading. Very popular picture frame for 11x14 size photos features a thin plastic edge and clear glass which pops out the front for easy loading. Very popular picture frame for 11x17 size photos features a thin plastic edge and clear glass which pops out the front for easy loading. Very popular picture frame for 12x12 size photos features a thin plastic edge and clear glass which pops out the front for easy loading. Protect and display your valuable vintage LPs in this classic record album format frame. Hard black frame with clear glass front. Very popular picture frame for 12x16 size photos features a thin plastic edge and clear glass which pops out the front for easy loading. Very popular picture frame for 12x18 size photos features a thin plastic edge and clear glass which pops out the front for easy loading. Very popular picture frame for 16x20 size photos features a thin plastic edge and clear glass which pops out the front for easy loading. These very popular Original MCS Format Picture Frames feature a thin plastic edge and clear glass that pops out from the front of the frame for easy loading of photos or documents. Mix and match frame sizes and styles to create a unique gallery wall. Note: Due to space limitations these frames will only accept thin paper mats. 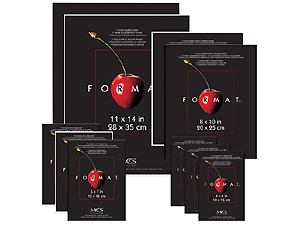 Frames over 11x14 can not be shipped outside the 48 continental US States.